This year’s Royal Winnipeg Ballet production of Nutcracker is a rather subdued affair. Set in St. Petersburg during Tchaikovsky’s time, the sets harken back to an era of restrained elegance. Scenery designer, Zack Brown, drew inspiration for this Nutcracker from the St. Petersburg drawing room of Tchaikovsky. Opening with the Christmas Eve party at the home of the Vishinsky’s, the story unfolds against the back drop of the Vancouver Symphony Orchestra under the direction of Peter Dala. It is a highlight of the evening to be treated to a live orchestra. The Christmas Eve party showcases Drosselmeyer’s antics as a magician as he hypnotizes the party guests. Touches of humour are added to the production with the eccentric mannerisms of Drosselmeyer and Babushka and Grandfather prompting delightful giggles from the children and adults in the audience. The evening is full of the wonderful costumes that Nutcracker devotees love to see. Cossack rats, armies of soldiers, white wolves, snowflakes, flowers and the Spanish, Arabian, Chinese and Russian dancers whose costumes evoke a by gone era. The dancing adds icing to the evening, reminding some why they return year after year and converting others to the love of dance. The dance of the Snowflakes set against a shimmering icy blue backdrop, the Sugar Plum Fairy and Cavalier, the Flower waltz with its soft apricot costumes all add up to making Nutcraker a seasonal favourite. The production ended rather abruptly with Klara answering the door at the Vishinsky residence on the following morning. 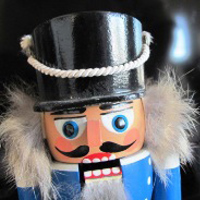 Drosselmeyer was there to present her with a Nutcracker. The curtain falls as Klara embraces her Nutcracker and wonders if it all has been just a dream.